A Practical Workbook for Non-Technicians in Schools and Libraries. This is a simple, illustrated introduction to managing the wide range of multimedia equipment--including audio/visual, computers and office machines--found in schools, libraries, and other information agencies. It is useful for students in college library courses, as well as staff appointed to manage the multimedia function in their organizations. The book covers maintaining video and audio equipment, projectors, photocopiers, digital cameras, scanners and fax machines; making purchase proposals; keeping records; and managing booking systems. It includes principles of operation, practical tips for setting up, troubleshooting common operating problems, and basic preventive maintenance for a variety of equipment. Included are plentiful, clear explanations and examples; numerous exercises with answers; a glossary with simple definitions of technical terms; a bibliography; and an index. 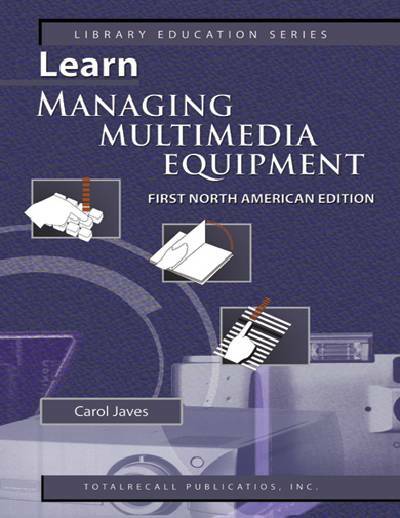 Learn Multimedia Management is one of nine study guides in the Library Education Series. Please see the back of this book for a complete listing, or visit www.totalrecallpress.com for more information. Carol Javes is an experienced librarian and library educator, who teaches the use, maintenance and management of audiovisual hardware and software and the wide array of other equipment found in libraries. She combines a sound understanding of her subject with practical guidance about what non-technicians need to know and be able to do in a school or library setting.